And so the Final Tribal Council always ends up as gripping drama, as we see everyday people attempt to articulate themselves in a highly stressful question-and-answer format with $1 million on the line. And again, add in the various off-the-wall questions* (or Sue Hawk condemnations) thrown in the face of the finalists, and you get one of the most fun half-hours of the year. In fact, if it were up to me, I would stretch the finale to a two-night affair, with the entirety of Tribal Council running the next night. It’s that good. *Like Natalie’s infamous question to Parvati: “How does your reputation as a flirt extend to the bedroom?” It was absurd. Sunday’s finale of Survivor’s 21st season almost has to be that good to vindicate what has been a disappointing first 13 episodes. Coming off a pair of superb seasons—the introduction of Russell in Samoa (which I missed), and the Heroes vs. Villains All-Star season—Survivor: Nicaragua was almost destined to fall short of that standard. The decision to split the tribes based on age exacerbated a fairly vanilla cast. Several of the older players seemed unfamiliar with basics of how the game was played; I’m thinking specifically of Jimmy T. The younger tribe, meanwhile, could rest on its strategic laurels, rarely having to face Tribal Council. That led to the manipulative tribe swap, which radically changed the game—more so than I initially envisioned. 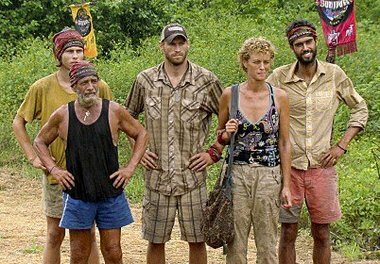 Overall, the epigraph to this season was provided fairly early by Marty: “It’s just frustrating to play a game with people that are so stupid.” One of the things that has really stood out during this season has been the number of castaways who have displayed little to no strategic acumen or audacity. No one wanted to do anything. There are usually a handful of players who try the coattails route, with one or two being successful. This season, it’s hard to think of anyone besides Marty and Brenda who approached the game with what could be considered a long-term strategy—and they were both voted out weeks ago. Others have spearheaded individual moves, but the main strategy in play this season has been to ride coattails. Nobody ever wanted to assume control of the game, meaning there haven’t been many coattails to ride for about the last four episodes. It’s an interesting final five, to be sure. 8. What if Alina and Kelly B. had been able to decipher the clue for the Hidden Immunity Idol before NaOnka and Brenda? It’s easy to forget that it was Alina and KB who found the first clue, largely because the art student and medical student couldn’t figure out where the idol was hidden. Had they located it, it’s probable that Sash’s minority alliance wouldn’t have had quite the same power early—remember: the HII helped bond NaOnka to Brenda, and by extension, Chase—and NaOnka would have gone home earlier, probably in the dual tribal episode. Of course, a lot of this depends on which of Alina and Kelly B. kept the idol, since they were eventually separated. Long story short, not that big a deal. 7. What if Kelly B.’s leg were real? Part of me thinks Kelly B. was voted off solely because she had an artificial leg. Another part of me thinks that Kelly B. wasn’t tight with anyone besides Alina, and that when they got separated she had little chance of lasting long regardless. I thought it was weird that Brenda and Co. voted her off even after failing to flush Marty’s idol, so there was probably some tension there unbeknownst to us. 6. What if Jimmy Johnson had proven early on that he was stronger than Dan? If the rest of Espada had realized earlier what a physical detriment Dan was to the tribe and voted him out instead of Jimmy in the third episode, Marty’s crusade to vote off the coach would have suffered, but probably not been killed—not even by Jimmy T.
Dan, on the other hand, would have been gone at an earlier, more appropriate time. Yve probably makes the merge as a result, possibly flying under the radar to the final five. It’s a stretch. 5. What if Brenda hadn’t been so loose with Hidden Immunity Idols? Brenda first helped NaOnka find her idol, then allowed Sash to maintain exclusive possession of the idol he bargained away from Marty. If she had either of those idols, it likely would have only been flushed the week she was voted out, with Benry going home instead. With NaOnka and Kelly quitting the following episode, Brenda would have been in the final six, and then Jane probably would have been voted out as a threat, and…you see where this is going. Brenda and Sash would still be tight, and they’d probably have the best chance of ending up in the Final Three. 4. What if no one quit? When NaOnka and Purple Kelly left the game two episodes ago, they pushed most of the power into the hands of Chase and Holly. They were Sash’s two closest remaining allies and, had they stuck around, likely would still be in the game now (with Benry, JudFabio, and Jane voted off before a pivotal final six vote that came down to whether NaOnka stuck with Sash or Chase. My guess—based off who she gave the idol to—is that she would have voted out Sash, leaving a final five of her, Chase, Holly, Kelly, and Dan). In the end, it may have worked out for Sash better that they both left. 3. What if Shannon didn’t go off at the second Tribal? La Flor’s first trip to Tribal Council was one of those early, season-defining decisions between Shannon and Brenda. Shannon had already allied himself with Benry, JudFabio, Alina, and Kelly B. before showing himself to be a misogynistic and homophobic lunatic when pressed by Jeff Probst. If Shannon had kept quiet, perhaps Brenda is the first La Florian eliminated, and Shannon’s alliance becomes the team’s core moving forward until the tribe swap. It’s impossible to project more than that, but it seems likely that Sash and Chase would not have made the final five, while someone like Alina probably would have. 2. What if Espada had lost the second Immunity Challenge? That same second episode initially centered on Holly’s coming undone at Espada. She yelled at Jill—a doctor—for eating snails, proceeded to toss the snails into the ocean, stole Dan’s shoes and buried them in the water, and then came clean about it all, which only made her sound crazier. However, Espada won immunity, with the help of the Medallion of Power, keeping Holly alive for at least one more episode—by which point Marty had placed his focus on Jimmy Johnson. Once the tribes switched, Holly was never a target again. 1. What if there hadn’t been a tribe swap? This is, of course, the biggest what-if of the season. I don’t think it’s a stretch to say that, at the time of the old switcheroo, Marty was in the best position in the game. He had a stranglehold on the Espada tribe, with a Hidden Immunity Idol and Jill, Yve, Tyrone, Dan, and yes, even Jane (kinda sorta) in his pocket as allies. What’s tough to play out is how the immunity challenges would have gone. How many would Espada have lost if it remained the tribe of the elderly, and how serious a disadvantage would it have been in at the time of the merge? I’m guessing La Flor could have had something like an 8-4 advantage. *Could Marty and Co. have swung enough votes away from La Flor? It isn’t that farfetched to see Alina jumping ship (she was eighth in that La Flor pecking order), and if Marty could grab Benry or JudFabio, he had enough to use the idol—still hidden to La Flor—to execute a blindside, most likely of Brenda. He would have had a 6-5 advantage at that point, with a chance to make it all the way to the end. *Proposed 12 at that merge: Marty, Jill, Yve, Tyrone, Brenda, Sash, Chase, Benry, JudFabio, Purple Kelly, Alina, NaOnka. So the one constant is that I don’t want to see Dan in the Final Three, for the same reasons I didn’t want to see Colby in last season’s Final Three. With Dan, it’d be an even greater travesty, but it’s much likelier. I usually think the most interesting final trios involve members of the same alliance, as we see who their former targets think was the most deserving of them. In this instance, would it be Sash, who manipulated most of the game but made virtually no close personal connections? Chase, who was widely considered the leader of that alliance despite bungling several decisions? Or Holly, who capitalized most on the tribe swap and played the maternal role to a tee? I also don’t know how any of the jurors would evaluate JudFabio, which is why he intrigues me. These really are complete guesses. This season has been odd in that what alliances there have been have been fluid and ephemeral. Brenda and Sash were close, but the residual of their once-tight alliance turned on them. Chase has been allied with everyone in the jury except Alina and Marty. And then there’s the fact that two jurors weren’t even voted out! Marty’s vote for Dan and Brenda’s for Sash are the only ones I feel kind of certain about. I’m guessing Na still thinks she’s tightest with Chase, that Purple Kelly rewards Holly’s faith in her, that Benry blames Chase more for his ouster than Holly, and that Jane is seriously vindictive. At the same time, a lot more votes will be up for grabs at the final Tribal than last time around, IMO. JF thinks he’s fairly tight with Sash, Dan doesn’t dislike JF as much as everyone else, Sash and Chase each respect Holly more than the other, and Holly has played longer with Chase than with Sash. I’m more confident in these than those supra. I have Holly winning each time she gets to the Final Three, crushing JudFabio and Dan 7-1-1 and holding on over Sash and Chase 4-3-2. Sash wins the three times he isn’t matched up with Holly, with Chase winning the last possibility over Dan and JudFabio. This is to say that Holly is the prohibitive favorite, provided she gets there. 5. Dan: Totally undeserving in every way. Not even likably undeserving. 4. Chase: Not undeserving in every way, but he’d be one of the weirdest champions ever. A physical threat who has not dominated physically, and who seems to genuinely make the wrong decision every chance he gets. 3. Sash: He’s grown on me a little, but I still don’t like Sash. And I get the feeling there aren’t a lot of people in the game or in the world who like Sash. He seems alienating. 1. JudFabio: Strangely enough, no one has articulated proper Survivor philosophies more frequently this season than JudFabio, whether it’s his criticism of Alina’s scheming, his awareness of playing stupid, or his “Find a happy place” mentality. I don’t think he’s the most deserving, but I like him the most. 5. Dan: I’ve said it time and again: You can’t conceive of a worse person to win the game of Survivor than Dan. He epitomizes everything that is wrong with the show—namely, that untalented, lazy (from a mental and physical standpoint), disloyal people can stick around by being untalented, lazy, and disloyal. Dan has done nothing of note throughout the course of this entire season. He was kind of friends with Marty, but even then, not to the point where they were really ever allied with one another. Virtually anyone can be in Dan’s position, provided they played the game much worse. He hasn’t seemed to have enjoyed or treasured the experience, and a victory for Dan might be enough to prevent me from ever watching the show again. Compared to Dan, Heroes v. Villains’ Colby, Tocantins’ Erinn, and Gabon’s Susie are practically Tom Westman, Sandra Diaz-Twine, and Parvati Shallow. 4. Chase: I was going to put him ahead of JudFabio, but it really takes a lot of wherewithal to make this many strategic misfires in a single season of Survivor. Chase made a mistake by spilling everything about his alliance with Shannon to Brenda in the second episode, went back-and-forth on whether to vote off Brenda, brought up his dad’s death constantly, and broke several promises. Although every person he has voted for has been eliminated and he himself has yet to receive a single vote, Chase’s status as the leader of the current dominant alliance is more perceptual than anything else: He had to be convinced to vote off Jane, just like he did with Brenda, and just like he did with Shannon. He’s been part of the big moves—just never the one making them. 3. JudFabio: There’s something to be said for not making mistakes or enemies. Unlike Dan, JudFabio has brought different things to the table all season. He’s done work around camp, he’s been a presence in challenges, and perhaps most importantly, he’s been a constant sounding board for other castaways. He was close enough with enough of the other players that he was never their main target. In most seasons, that’s not enough to make you the third-most deserving player; this isn’t a normal season. 2. Sash: All told, I have no qualms with Sash winning this version of Survivor, especially if he’s able to successfully maneuver Holly out of the game before the Final Three. He formed the game’s most important alliance early on with Brenda and NaOnka, and he made strong plays by convincing Marty to give him the Hidden Immunity Idol and then not using it to save Brenda. Sash wasn’t the best at maintaining his alliance; it spoke volumes when he and Brenda became swing votes in the middle of the season, and then when he himself became a seventh wheel a few episodes ago. But he at least was instrumental in many of the game’s defining moves, which is more than can be said for the three who precede him on the list. 1. Holly: No one adapted their game to this season’s unique circumstances better than Holly. The tribe swap reinvigorated her after a terrible start, and she thrived playing the mom at the younger La Flor tribe. She excelled most in maintaining that maternal image while also doing much of the game’s most significant scheming, mainly by changing the dynamics of the final weeks by spearheading Operation: Take Out Brenda. She’s been the real leader of the current alliance with Chase and Sash, dictating the last vote for Jane. Holly wouldn’t be the most deserving winner of the show’s history, but she’s head and shoulders above this group. JudFabio outlasts Chase in the first Immunity because he needs it more. The main alliance then has the unenviable task of deciding whether to cannibalize one of their own or vote Dan off when they all want to take him to the Final Three. JudFabio wants Chase out, since he’s the biggest physical threat. Chase and Sash want Holly out, since she’s their biggest threat in the jury. Holly wants Sash out, since he’s her biggest threat in the jury. It all comes down, amazingly, to who Dan wants out, and for once he has to actively make a decision. In the end, the shoe incident finally comes back to haunt Holly, who’s voted out. Sash claims the final immunity challenge, which as I’ve guessed all along will be more focus-based than anything else. He has no qualms about sending what he feels is his only legitimate jury competition home, eliminating Chase. In the final Tribal Council, Sash stumbles when pressed by a few of the jury’s questions, particularly when Marty wonders why Sash didn’t warn him that he was in trouble and potentially give him his idol back, as promised. Chase also attacks him for voting him off instead of JudFabio or Dan. While Dan can provide virtually no reasons for his making the finals, JudFabio performs much better than expected in the Q&A portion, revealing that he played an underrated social game while peaking physically when necessary. He makes a compelling argument. Marty gives Dan a token vote, while Brenda, NaOnka, and Purple Kelly all vote for Sash. Jane, Alina, and Chase all vote for JudFabio, meaning it comes down to Benry and Holly. Benry offers some eclectic praise for the way Sash played the game—Benry strikes me as someone who always wanted to be in Sash’s main alliance—in voting for him, while Holly honorably says to the camera, “I can’t fault you for making the right decision in getting me out when you did,” giving Sash the fifth vote he needs to win Survivor: Nicaragua.